The man taking over an FBI under the spotlight after the abrupt firing of director James Comey — is described as a respected and a fast-rising member of the bureau with a past focus on terrorism. The shakeup of the federal investigation agency — in the midst of probes into alleged Russian interference in the U.S. presidential election — took some Democratic lawmakers by surprise and raised charges of a "Nixonian" move by the Trump administration. Andrew McCabe, who joined the FBI 20 years ago and was promoted to deputy director last year, was named acting FBI director, a Justice Department official said. It’s unclear who Trump will nominate to replace Comey, but Senate Democrats could insist on a special prosecutor for the Russia campaign probe as a condition of voting for a replacement, a senior Democratic aide said. McCabe, who is considered to be well-respected inside the FBI, recently surfaced in reports that Trump’s chief of staff sought agency help to knock down stories about Russia and the campaign late last year. In the end, the FBI did not get involved, and the White House said there was nothing improper. A law enforcement source said FBI officials also did not consider any lines to have been crossed. 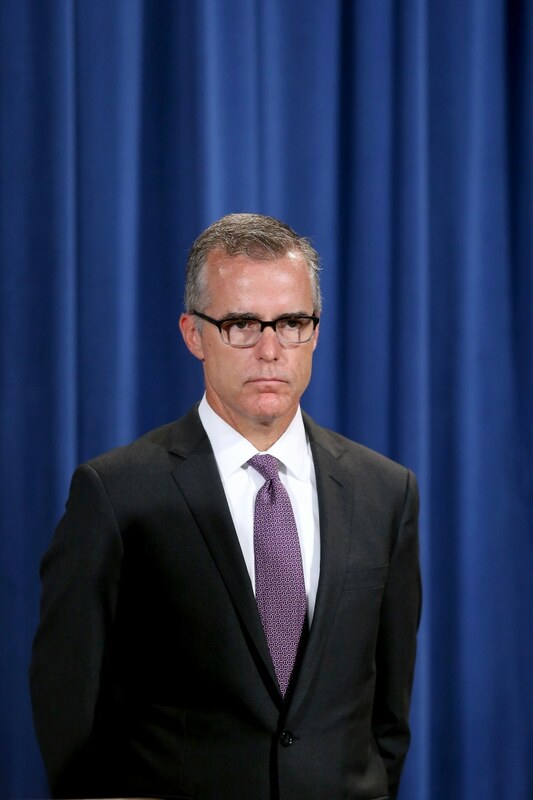 McCabe joined the FBI as a special agent in 1996 working out of New York, where he focused on organized crime. He was promoted to a unit focusing on counterterrorism and extraterritorial investigations of Sunni extremists in 2006, and in 2016 was promoted to deputy director of the FBI. In February, senior Trump administration officials told reporters that McCabe pulled White House chief of staff Reince Priebus aside to say a New York Times report that said the FBI was examining evidence of contacts between Trump aides and Russians during the campaign was inaccurate. According to an anonymous senior administration official, Priebus responded to the FBI's McCabe: "Okay, what am I supposed to do?" and "How do we fix this?" According to a White House official, McCabe then talked to other officials at the FBI and determined there was nothing the FBI could do. FBI officials said they didn't want to get into the business of publicly parsing elements of news reports. A senior law enforcement source told NBC News at the time that it wasn’t clear which side first brought up the stories. At the time White House officials said Priebus didn’t do anything wrong, and senior law enforcement official said FBI officials also did not consider any lines to have been crossed. But Democrats seized on the reported conversation as a violation of longstanding traditions holding that the FBI must be independent of the White House. After Tuesday’s firing of Comey, those questions were raised anew. The White House said the search for Comey’s replacement would begin immediately, so it is unclear how long McCabe will remain as acting director. Trump met with McCabe in the Oval Office for around 30 minutes Tuesday, NBC News reported. When McCabe was promoted to deputy director in 2016, he said in an interview that terrorism by groups like ISIS was one of his top priorities. "That is the scariest thing for me right now," he told the Los Angeles Times. "It's the broadening and intensity of the terrorism threat, the crowd-sourcing of terrorism, the flood of propaganda, the enormous number of folks who have become swept up in that propaganda." When he was promoted to deputy director the FBI said McCabe "will oversee all FBI domestic and international investigative and intelligence activities and will serve as acting director in the director’s absence." McCabe was appointed to replace deputy director Mark Giuliano, who retired, the FBI said. A former colleague described McCabe as a smart and young agent who enjoyed a rapid rise. McCabe’s wife, Jill, ran as a Democrat for Virginia state senate in 2015 but lost. The Wall Street Journal reported in 2016 citing campaign finance records that the political-action committee of Democratic Virginia Gov. Terry McAuliffe gave nearly $470,000 to her campaign, and that McCabe later helped oversee the FBI investigation into Hillary Clinton’s use of a private email server. The FBI said in a statement to the Wall Street Journal at the time that McCabe "played no role, attended no events, and did not participate in fundraising or support of any kind. Months after the completion of her campaign, then-Associate Deputy Director McCabe was promoted to Deputy, where, in that position, he assumed for the first time, an oversight role in the investigation into Secretary Clinton’s emails." McCabe graduated from Duke University in 1990 and got a law degree from Washington University in St. Louis, and considered a career as a prosecutor but ultimately chose the FBI, the Los Angeles Times reported. He spent three years in private practice because the FBI had a hiring freeze at the time. "On the civil side, it's ultimately about people arguing about money," he said in the Los Angeles Times in the 2016 interview. "On our side, it’s about passion, violence and intrigue. That is the stuff that makes people tick."